Make no mistake about it. Chipotle (NYSE:CMG) is finally back. The E. coli outbreak which hit the chain hard in 2015 is now in the rear-view mirror. The company is using new marketing, menu innovations and an expanded digital presence to drive a long overdue recovery in traffic, sales and margins. In response, CMG stock has rallied from $250 in February 2018, to $660 a little over a year later. Some bulls think this monster rally will continue. Piper Jaffray recently lifted its price target on CMG stock to $725, citing international expansion potential as a reason to buy Chipotle stock. But fundamentals say that this big Chipotle stock rally is on its last legs. To be sure, the fundamentals at Chipotle are improving. Unique marketing campaigns, healthy food menu innovations, and digital business expansions are driving robust and sustainable comparable sales and traffic growth. That’s pushing margins higher. Plus, the company still has a ton of runway left on the unit expansion front (only 2,500 stores). But all of those positives are already priced into CMG stock. This is a $650 stock with a fiscal 2019 earnings estimate of $12.30 per share. That means Chipotle stock is trading at over 50x forward earnings. The average forward multiple in the restaurant sector is under 25. Thus, CMG stock is trading at more than double the valuation of its peers. Even for a company with as big of growth potential as Chipotle, that relative valuation gap is just too large. It will eventually narrow, and in a big way, meaning that Chipotle stock is due for a sizable correction in the near future. The Chipotle turnaround is very real and very impressive. Long story short, Chipotle brought in new CEO Brian Niccol about a year ago, and he’s done nothing short of a spectacular job turning around what was a sinking ship. Before Niccol, Chipotle was a company struggling with its brand image, which had no real growth drivers in the aftermath of a crippling late 2015 E. coli outbreak. Since Niccol took over, all that has changed. Chipotle has re-branded itself as a healthy QSR chain with real ingredients through its new ‘For Real’ marketing campaign. To coincide with that marketing campaign, Chipotle has also expanded its menu to include things like lifestyle bowls, which cater to the ingredient-sensitive consumer. Meanwhile, Chipotle has also significantly expanded its presence on digital food-ordering apps. These three initiatives have worked wonders for Chipotle. Traffic growth has turned healthily positive for the first time since late 2015. Comparable sales growth is running around 10%-plus. Digital sales growth was above 65% last quarter. Restaurant level operating margins are moving consistently higher. In other words, the Chipotle turnaround is here. It won’t end any time soon. As such, the fundamentals underlying CMG stock project to remain favorable for a lot longer. At current levels, favorable long-term growth fundamentals won’t cut it for CMG stock. It’s already priced for favorable long-term growth, and then some. This is a restaurant stock trading at over 50x forward earnings. The whole market trades at 16x forward earnings. Restaurant stocks trade at 23x forward earnings. High growth application software stocks trade at 35 forward earnings. Indeed, on a forward earnings basis, CMG stock is more expensive than Facebook (NASDAQ:FB), Alphabet (NASDAQ:GOOG), Twitter (NYSE:TWTR), Adobe (NASDAQ:ADBE), Alibaba (NYSE:BABA), and Intuitive Surgical (NASDAQ:ISRG), all 20%-plus revenue-growth tech companies with sky high margins and big moats. It’s also nearly as expensive as Amazon (NASDAQ:AMZN) and Salesforce (NYSE:CRM), two huge revenue-growth companies with tremendous margin expansion potential. That doesn’t make much sense to me. Again, CMG is a restaurant stock. With a sub-10% revenue growth rate. In a competitive fast casual restaurant industry. And margins that, while heading higher, don’t have that much more room to expand. Here’s my math on Chipotle stock. Mid-single-digit comparable sales growth will likely slow going forward as the lap gets tougher. But comps will remain in the low single-digit range thanks to menu innovations and digital business expansion. Sustained mid-single-digit unit growth should drive high-single-digit revenue growth. Restaurant level margins should continue to rise, but flatten out short of their mid-2010’s highs due to higher labor costs. G&A and D&A expense rates should fall with scale. Putting all together, I optimistically see Chipotle as a 20% earnings grower over the next several years, with potential to hit $35 in EPS by fiscal 2025. Based on a slightly above restaurant-average 25x forward multiple, that equates to a fiscal 2024 price target for CMG stock of $875. Discounted back by 10% per year, that equates to fiscal 2019 price target below $550. Chipotle stock trades above $650 today. As such, this stock is simply overvalued at the present moment. The Chipotle turnaround is here, and it’s not going anywhere anytime soon. But CMG stock has already had its big run-up in anticipation of this recovery. At current levels, the stock is overvalued. As such, the next time this company fumbles, the stock could drop in a big way, and in the restaurant industry, fumbles happen all the time. As of this writing, Luke Lango was long FB, GOOG, TWTR, ADBE, AMZN, and CRM. 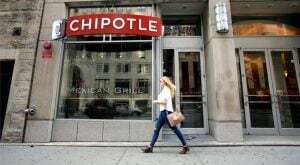 Article printed from InvestorPlace Media, https://investorplace.com/2019/03/heres-why-chipotle-stock-will-plummet-on-any-negative-headline/.